OK....you take photographs....but they look like every day, boring snapshots. Hmmmmm....the subject matter was interesting, the shot was in focus, there were no distractions, like an over flowing trash can or somebody photo-bombing the picture. Why am I not satisfied with my photo?? Well, one factor could be the basic COMPOSITION...how the subject is situated within the frame. That's what I'm going to review today. The holidays are coming up and our our photographs are our memory landmarks. Let's make them count! Very often I am told I have a "good eye" for photography. I have the same eyes as everyone else. I just use them with the following composition "rules" in play. I'm going to go over three (that's a magic number today!) 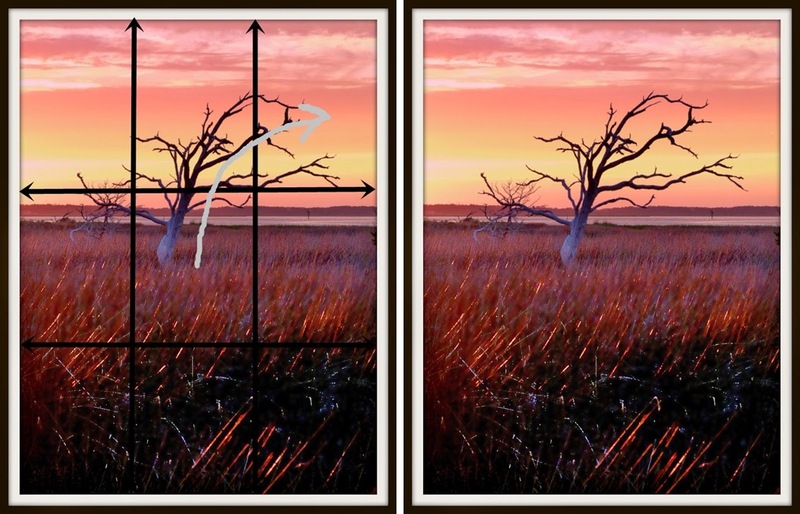 basic composition elements that will help enhance your photos. This is my take on "photographic composition", but of course, there are articles all over the internet on this topic if this post piques your interest and you would like to delve into it further. These are nothing new! They are used in every genre of visual art....not just photography. They visually impact your photograph in subtle, but very important ways to add interest and a subconscious, pleasing arrangement....of anything! SIDE BAR: Please use your viewfinder to frame your pictures....not the LCD screen on the back of the camera. Anytime you have the camera held out in front of you, there is no steadiness, there is often a glare on the screen and you are seeing everything around you while you are trying to compose your picture. Get in the habit of using the viewfinder! OK...let's get started! First things first....see if your camera has a "grid" feature. 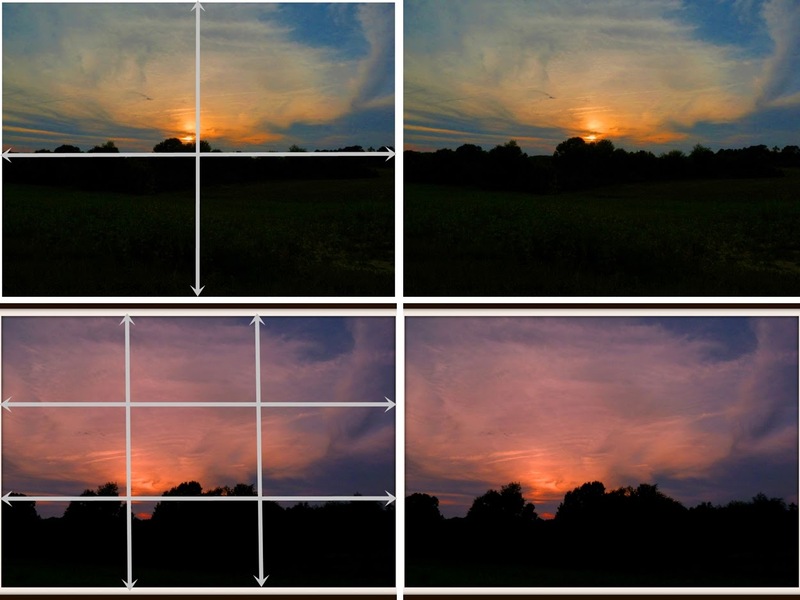 This grid divides your picture into thirds...up and down and side to side...and also helps you keep a straight horizon or vertical line. Turn this on and leave it on! If your camera does not have this feature, just look at my examples and embed the grid into your vision as you look through the viewfinder. I have hand drawn the grid onto my examples, so they will more than likely not be exact thirds, but will be close. So.... what in the heck is she talking about??? Trust me, these composition elements are very easy to follow and soon you will not even have to think about them....they will come natural as you compose your photos. This is a simple example of the Rule of Thirds. The top photo is cut in half both ways. A BIG NO-NO! As nice as the colors are, it doesn't need all the land mass...it adds nothing to the picture. 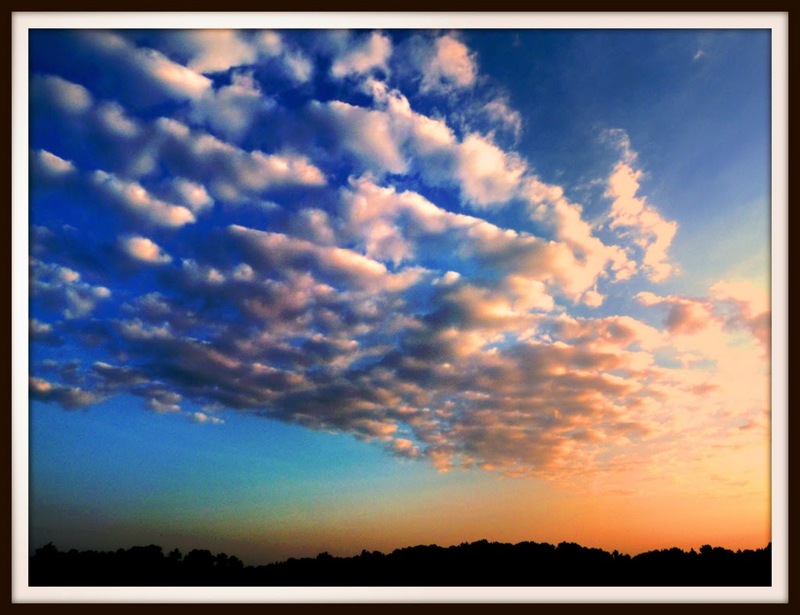 The bottom photo is virtually the same scene...with the Rule of Thirds applied. 2/3 sky (which is the interest factor); 1/3 land in order to "ground" the photograph and the sun is not dead center which adds a hint of extra interest. NOTE: Nothing of interest in the very center of the photograph, yet it is more appealing than the one above it. Same scenario. While it is 'okay', the first photo is cut right in half showing lots of ground and an unimportant plant. It does show the 'vastness' of the desert but if that is the main idea, the sky should have been cropped to just above the tall cactus...some of the clouds wouldn't be missed. 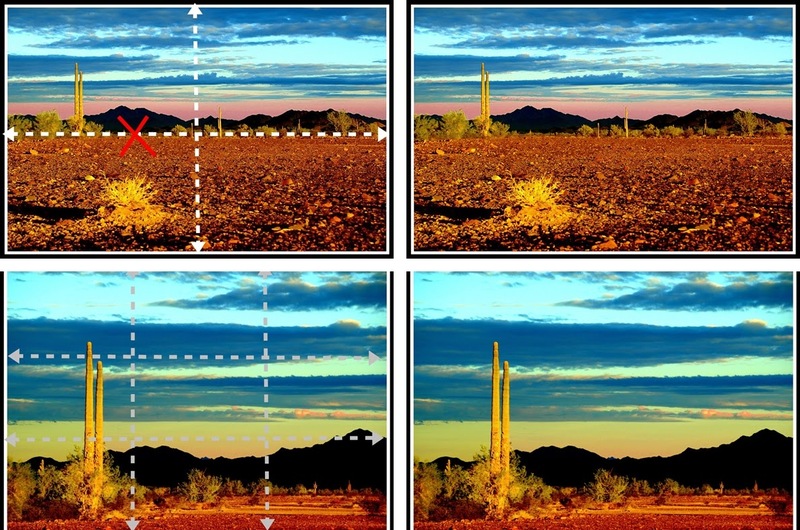 The second photo has the interesting saguaro cactus in the left 1/3, the mountains and ground in the bottom 1/3 and the striated sky in the top 2/3 of the frame. The three elements (cactus, sky, mountains) of the photo are highlighted in a more visual pleasing way using the Rule of Thirds. As you can see, there is a lot wrong with this photo....again, it is cut in half both ways. All you really see is the column running down the center of the photo. UGH! The white hats cut the photo in half the other way. Not good. Again, the main focals are in the left third and bottom third of the photo...nothing of interest in the very center. Your eye moves around the photo. There are FIVE highlighted lily pads, SEVEN all together. Speaking of movement, look for parts of the scene that draw your eye to a certain area. In this case, the trees, mountain and rocks pull your eye to the farthest point of the lake and the mountain behind it. The horizon line is just below the 1/3 line because I didn't want to cut off the clouds. But the focal point is still well out of "center". Keep your subjects moving in the photograph by having them "walk" (or look) into the empty 2/3 of the photo in the direction they are headed or looking. Otherwise, they would be walking into the side of the frame....OUCH! LOL! Give them a path! Again, movement toward the ONE subject which is in the right third of the frame. How boring it would have been if the flower were right in the center. There's a lot going on in this photo but that doesn't mean we can't apply the "rules" we've learned. They are all in this photo, with no focal point in the center. Now that your eye is "trained" a bit, I think you can see them. Rules are made to be broken! There ARE times when you want to make the center of the photo the focal point. This is a good example...the light at the end of the tunnel! Note, tho', the Rule of Thirds is still active. This fisherman's torso is in the middle of the frame, but his head is in the top 1/3, so your eye goes there. THREE archways...THREE children. Another example of creative centering. In this case, it was important to show the grasses shimmering in the sunset light. They were more dramatic than the actual sunset. The tree is the main focal point, however, only the bottom of the trunk is [almost] in the center...the limbs bring your eye away from center to the upper 1/3 of the photograph and the horizon line is almost at the 1/3 mark. Symmetry. Sometimes you want to photograph one object. Period. Here's where you want to center it exactly in the middle of the frame. No tricks or rules. It's just centered. In this example, I had the use of the Odd Number element, too. I took advantage of symmetry in this photo of an interesting cyclist. Each side is the same with the fellow in the center. However, his head is in the center upper 1/3 with certain elements directing your eye upwards. All three "rules" followed here. Finally, a few samples of NOT following the Rule of Thirds on the horizontal. One example is a reflective "mirror image" in a body of water. If you positioned the bottom of the photo in only 1/3 of the frame, you would lose part of the reflective image. You want the same, top and bottom. However, your eye is still drawn to the left third of the frame with the tree line, clouds and distant mountain. These next two example are all about the clouds! 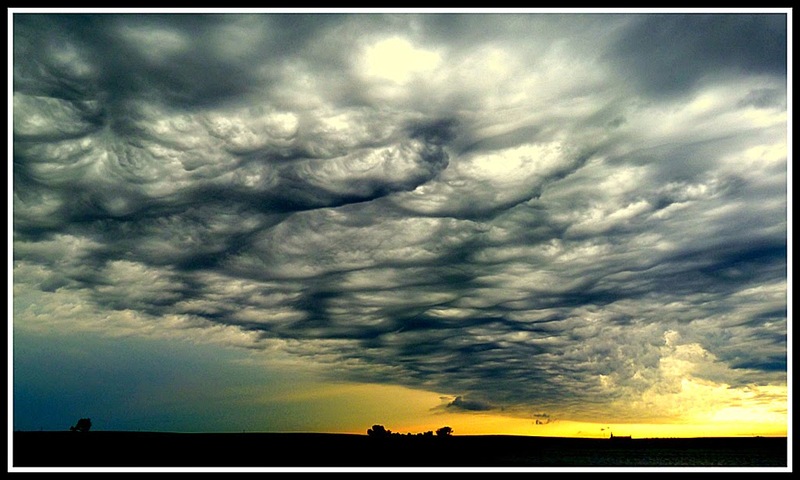 Who needs to see land with clouds like this?? Cut off the ground to the bare minimum! But, again, the eye goes to the bottom 1/3 of the photo due to the cloud line and the position of the light/sun/color. For "artistic drama", again, cut off the ground. This example gives the idea of total isolation on the beach overlooking the never ending ocean. The focal point is off-center in the bottom 1/3 of the frame. I minimized the ground in this photo, but placed the convenient cloud line at the 1/3 mark. I know this was long, but I hope I gave you plenty of examples of the three basic composition elements. YOU can have a "good eye", too! Just follow these simple "rules". Practice taking shots around your house/yard. They don't have to be National Geographic scenes...just practice looking through your viewfinder, dividing your photo into thirds, finding odd numbers, and add "movement" by placing your subjects so they, and your eyes, follow a trail. Most of all, have fun with your camera! Thank you for being an Amazon shopper through my links! I am thankful for your orders! This is an awesome post! I love to take pictures, but yes, they are usually boring! This will give me some guidelines on my next batch! They are very easy rules to follow, too. Most phones, computers, etc. have an edit feature so that makes it easy to "fix" after you've taken the picture! Thanks!